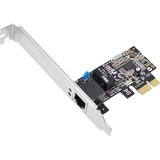 The high-performance PCE-1G-01-LP 1-Port Gigabit Ethernet PCI Express Card adds a 10/100/1000 Mbps network card and RJ45 Ethernet port to your computer or server. 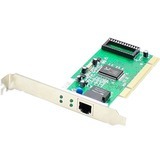 By adding the PCE-1G-01-LP to a computer with either no networking capabilities or 10/100 Ethernet, you can upgrade to Gigabit Ethernet capability without having to buy a new computer. 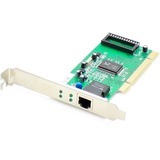 It supports 10/100/1000 Mbps data rate auto-negotiation. 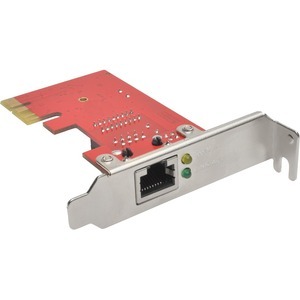 Perfect for home or office, the PCE-1G-01-LP lets you connect to your high-speed LAN at Gigabit speeds up to 1000 Mbps. It easily installs inside your computer in just a few minutes. 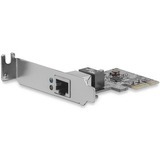 The low-profile bracket's one-lane (x1) interface is compatible with x4, x8 and x16 PCIe slots. 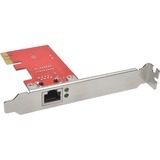 Allow the appropriate drivers to automatically install on your hard drive (a driver CD is included if they don't), and connect a Cat5e/6 patch cable between the card's RJ45 slot and your network. An LED indicates successful connection and network activity. 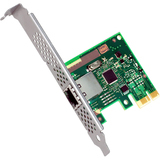 The PCE-1G-01-LP is backward compatible with 10/100 Mbps networks and complies with PCI Express Revision 1.1. 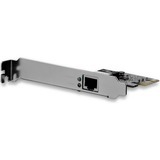 Fully compliant with IEEE 802.3, 802.3u and 802.3ab. 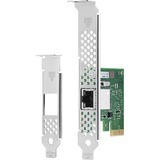 Supports IEEE 802.3x full-duplex flow control, 802.1p Layer 2 priority encoding, 802.1a VLAN tagging, crossover detection and auto correction (auto MDI/MDI-X), Wake-on-LAN (WoL) and 9K Jumbo Frames.